Great tasting Chinese food easy to make and easy to adapt. Feel free to use rice noodles instead of the fettucini and use whatever vegetables you prefer. Place sliced pork in a bowl. Mix 2 tablespoons soy sauce and 2 teaspoons cornstarch in small bowl and pour over sliced pork. Refrigerate pork for 20 minutes or more. Boil pasta according to box directions. When pasta is done, thoroughly drain and mix with the sesame oil. Set aside. In small bowl while pasta is cooking mix 3 tablespoons low-sodium soy sauce, sugar, and rice vinegar. Reserve for later. Heat a heavy pan or wok. When pan is hot, add 2 tablespoons oil and cook pork strips until white and cooked through. Remove pork to a bowl and keep warm. 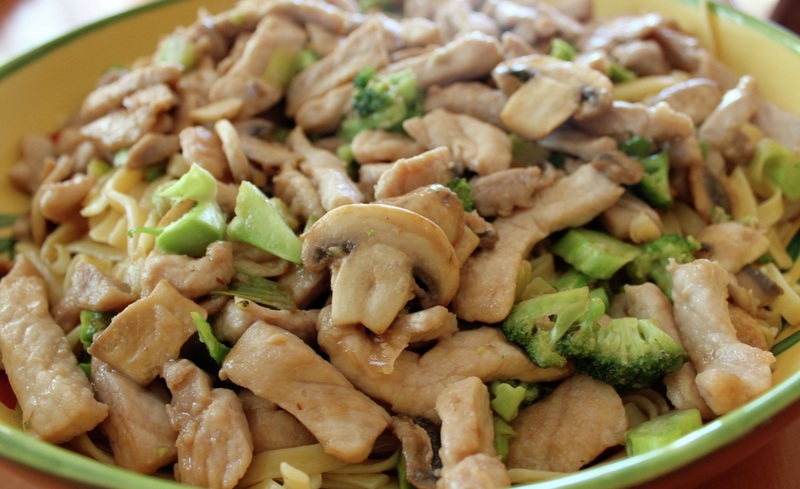 Heat remaining 2 tablespoons oil, when hot stir-fry mushrooms, broccoli, and green onions for about 2 minutes. Add pork back into the pan along with the reserved soy sauce/cornstarch mixture. Bring to boil. Add noodles to pan and mix well before serving.